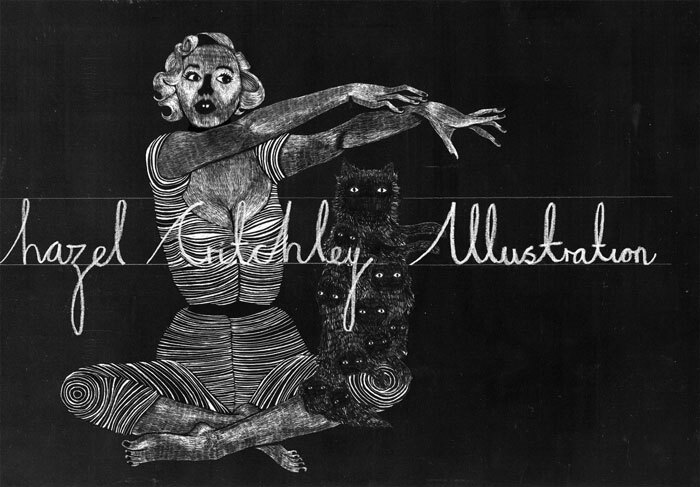 "A happy Illustration Rally hello to Hazel Critchley. Hazel, living in the north by the coast seems to trap her environment within her work and as she takes influence from the world around her and from her foreign travels to Finland and Poland her work takes on the character of the place and yet is composed with striking originality. She works on a lightbox happily scratching away dark and brooding images in a process resembling intaglio print but with a level of control tailored down to each individual scratch her work becomes a living thing produced in a way that has the character of folk art and the lithe sensuousness of art nouveau. she combines the work together digitally producing a very strong tonal composition that is backed up by a real juxtaposition of colours that seem to hang across the eye and play to the delicate yet bold figures. Her work has a raw yet enlightened touch, which leaves the viewer satisfied yet intrigued. Great work from a fabulous illustrator, read about her here."